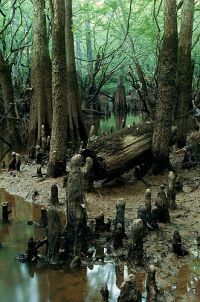 Zigolis Swamp is a marshy place full of amphibians and bugs. Due to the influence of the Mana Stone of Moon within the Beast Kingdom to the north, Zigolis is shrouded in eternal night. This means that you'll need to have a light to see, regardless of what time of day it is. Tourists speak highly of the putrid stench of the murky waters and the beautiful sights to take in while trudging through the area. Take home a jelly cap as a souvenir to show the family! Zigolis Swamp serves as a road connecting Viorar to Faron Woods to the north. Various pokemon and some slimes inhabit the swamp, though a weird old man does frequent the area. The Beast Kingdom claims any land that falls under the influence of the Mana Stone of Moon except for Viorar. - Catch frogs for someone. - Defeat a master slime. "Pokemon don't have innate elements, so analysis scrolls are useful tools for wizards. Always be on the lookout for hidden exits!" This page was last modified on 13 February 2016, at 09:46.